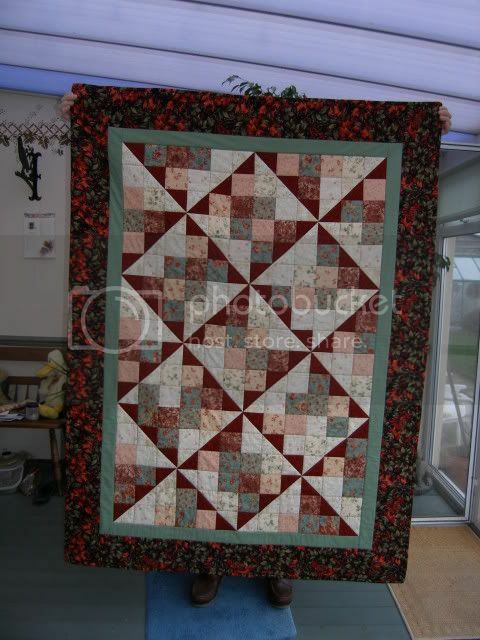 I love the fabrics I used in the one.... At a small learning craft center. Has knitting, quilting, stained glass,drawing, art, plus other crafts. I belong to the knitting group. We have this group of ladies who belong to the as they call it textile group, that think just because I've had no lessons in quilt making, that I don't know how to do it. So I am being very shallow and taking this on Thursday to prove other wise. This is beautiful! I love the borders and the way the colors work together. Thank you Polly. I found the border fabric first, and build the rest of the quilt from those colours. Thank you. I hope your keeping warm up there. Where I am isn't too bad, thank goodness. Really classy! I do love the colours you've chosen for it... And as for being shallow? Go for it! Never mind not having had lessons - you could give lessons! Thank You.. I found the border fabric first, and built the other colours from that. When I get the snail perfected. I would very much like to make you one, if you would like one? And sorry for only just replying - I'm not sure if it's the problems with LJ or if my Gmail account is being a bit iffy, but I seem to be getting notifications out of order and now and again a day or two late. That's great. I will be busy now until after Christmas, then I will have time to sew again. Thanks Bev.. I found that fabric first, and built the other colours from that. 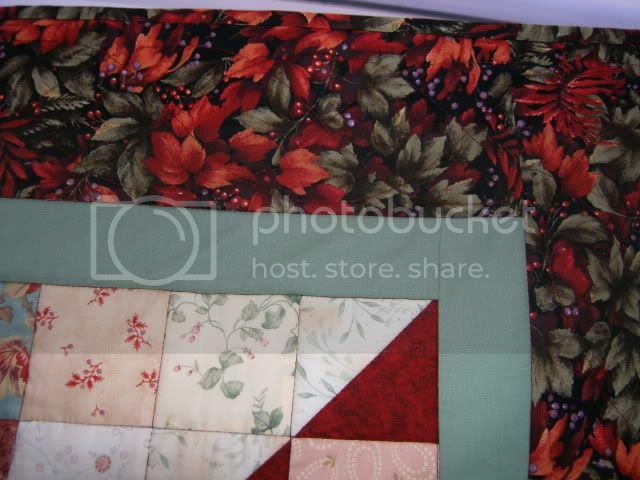 I just loved the rich colours in the border and I like leaf and berry fall colour fabric's. Thanks Chris. Hope you guys are staying warm up there, it is quilt weather thats for sure. Some years behind I also was part of a group of ladies that did paintings in fabric, was good too be with them, good times. Thank You.. I love the fall colours.